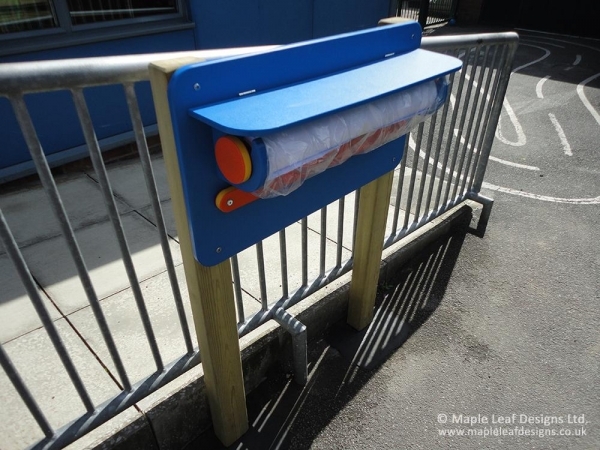 Outdoor arts and crafts sessions are made easier with our Paper Roll Dispenser. Pair it with any of our outdoor tables to create an art station that kids will love. Simply fit your paper roll inside the dispenser and children can pull out and tear off paper for their masterpieces. We can make these units to any width you like to fit your most commonly used paper rolls, and its durable engraved plastic construction can be either wall-mounted or free-standing to best suit your needs. It’s a real time-saver for children and staff, allowing more time for creativity. Available in various widths for different paper sizes.